Kuching, 15th January 2018: Sarawak continues to sustain its global appeal in Business Events as Sarawak Convention Bureau (SCB) and industry partners secured 89 more Business Events (BE) in 2017 – 60 bids won and 29 bids supported – which is disbursed statewide from 2018 to 2022. In addition to injecting a further of RM 107 million in economic contribution, Sarawak played host to a total of 47 conventions, including the renowned 13th World Islamic Economic Forum and the International Summit on Peace. 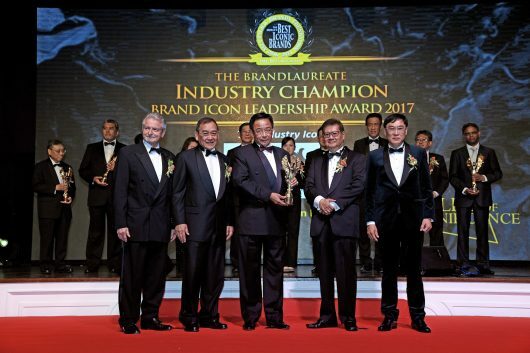 SCB’s extensive branding efforts, under the Redefining Global Tribes campaign has also led to Sarawak’s win of the BrandLaureate Industry Champion Icon Brand Icon 2017 in the MICE (meetings, incentives, conventions and exhibitions) and Destination Branding category. This marked the 2nd BrandLaureate win since the Bureau’s inception in 2006. The BrandLaureate Industry Champion Icon Brand Icon 2017 was received by Datuk Karim Rahman Hamzah (3rd left), Minister of Tourism, Arts, Culture, Youth and Sports Sarawak flanked by Tan Sri Dr. Muhammad Leo Michael Toyad Abdullah (2nd left), Chairman of Sarawak Convention Bureau. In 2018, Sarawak will welcome at least 27 high profile Business Events in substantial fields including the 5th International Marine Conservation Congress, 17th Continuing Professional Development Series: Diabetes Asia Conference, the 10th Clean Air Asia Better Air Quality Conference and the much awaited 9th Anak Sarawak Awards. “These results, yielded in the past 12 months, are attributed to the unceasing dedication of the immediate SCB team, our industry partners as well as immense support from the government. Building on 2017’s strong performance, we are excited to attract more Business Events this year; to further promote international partnerships, new research transfers, and mediate economic transformation,” said Amelia Roziman, Chief Operating Officer of SCB. SCB, established in 2006 by the State Government to provide professional advisory services to meeting planners, has pushed the envelope by positioning Sarawak as one of the leading 2nd tier destinations in Business Events within the Asia Pacific.